Furthermore, .NET Core is Microsoft's new improved and faster version of .NET aimed specifically at these kinds of tasks. So why is it beaten by all those languages? I suspect that a large part of this is the change in workload from the kind of number crunching .NET was designed for to a modern string-heavy workload and I suspect .NET's GC isn't as optimised for this as the JVM is. As we have found, .NET has really poor support for JSON compared to other languages and frameworks, with support fragmented across many non-standard libraries. Amusingly, OCaml has standardised on Yojson which we have found to be much faster and more reliable despite the fact that it is a hobby project. Another interesting observation is that C and C++ are doing surprisingly badly. The fact that Perl and PHP are beating C++ is doubtless because they are calling out to C code but that seems less likely for Rust, Java, Kotlin and Go. One interesting hypothesis I read on the interwebs is that C++ developers tend to copy strings a lot in order to avoid memory management bugs whereas Rust protects its developers from such bugs so they can be more efficient without having to worry. If true, that would be quite amazing because the user-land code behind these benchmarks isn't that big and, yet, C++ has already failed to scale and has developers reaching for one-size-fits-all-badly solutions. Whatever the case, one thing is clear: the time is ripe for new languages, VMs and frameworks. On "Quantifying the Performance of Garbage Collection vs. Explicit Memory Management"
The computer science research paper "Quantifying the Performance of Garbage Collection vs. Explicit Memory Management" by Emery Berger and Matthew Hertz contains an interesting study about memory management. However, the conclusions given in the paper were badly worded and are now being used to justify an anti-GC ideology. Oracular memory management (precomputing the earliest point free could have been inserted). On one VM, the Jikes Research Virtual Machine (RVM). Using one programming language, Java, and consequently one programming paradigm, object oriented programming. Using each of the five different garbage collection algorithms provided by that VM. Note that none of these GC algorithms are in widespread use today. The only one that comes close is Semispace which is one of Erlang's GC algorithms, albeit used in a substantially different way. In fact, the algorithms studied are all at least 30 years old. The experimental results presented in the paper are very interesting and immediately raise many questions. Perhaps the most obvious question is: do these results generalize to any other programming paradigms, languages, virtual machines or garbage collection algorithms? In the absence of evidence let's just think about this first. Functional languages use different data structures (purely functional or persistent collections) in different ways (recursion via tail calls rather than loops and mutation) so I see no reason to assume that they would behave in the same way that Java does in this context. 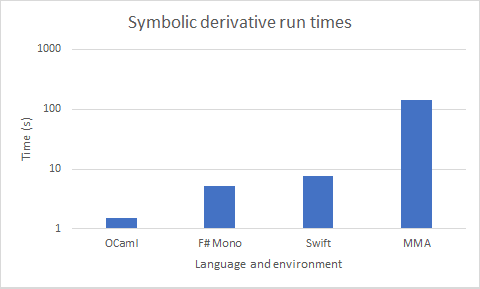 Indeed, lean functional languages like OCaml famously require far less memory than Java to solve the same problem and the relative bloat is usually attributed to object oriented programming. Closer to Java is C# on .NET but even this is substantially different because reified generics and value types result in aggressive unboxing giving a flatter heap topology and relieving stress from the GC. This manifests particularly in the context of hash tables where .NET provides an efficient generic hash table implementation that the JVM is incapable of expressing. So it seems extremely unlikely that these results would even generalize to .NET languages like C#. Still, the observations are interesting. Sadly, rather than asking these obvious questions and suggesting further work the authors chose to draw several completely unjustified conclusions. Worse, this paper passed peer review and has been published containing these unjustified conclusions and is now being bandied around on the internet. "In particular, when garbage collection has five times as much memory as required, its runtime performance matches or slightly exceeds that of explicit memory management"
The evidence described in the paper justifies the conclusion that at least for these benchmarks in Java on the Jikes RVM the GenMS GC algorithm requires five times more memory than oracular memory management to achieve the same level of performance. This extremely specific observation cannot possibly be generalized to all garbage collectors. 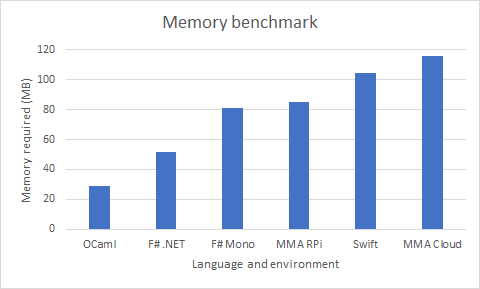 "Practitioners can use these results to guide their choice of explicitly-managed languages like C or C++, or garbage-collected languages like Java or C#"
Not only is there no evidence that these results have any bearing on C# whatsoever but there is also no evidence to substantiate the implication that the oracular memory management studied here is at all representative of hand-written C or C++ code. Remember: the oracle precomputes the optimal place to free every heap allocated block of memory. Is it reasonable to assume that human software developers will do the same? Absolutely not. In practice, software developers using such languages employ pool allocators that amortise the cost of allocation at the expense of dramatically increasing the amount of floating garbage. Furthermore, the program generated by the oracular method is not a general solution that will run correctly on different inputs: it is only correct for and is optimised for the one input it was given! This is akin to hoisting computation out of the benchmark and is completely unrepresentative of real software. So, again, it seems extremely unlikely that the oracular memory management described here (although interesting) is at all representative of manual memory management in practice. Finally, there are two major families of garbage collection: tracing and reference counting. All of the garbage collectors covered by this paper are tracing garbage collectors so the results say nothing about reference counting at all, much less the whole of garbage collection in general. This paper is another piece of an interesting puzzle but it is a puzzle that will never be solved. No amount of objective quantitative factual evidence can ever be enough to justify a completely general conclusion about garbage collection. Hopefully someday someone will repeat this experiment using a different VM, like .NET Core, and a different language and paradigm, like F#. Until then, there is no evidence to support the hypothesis that garbage collection requires 5x more memory to achieve the same performance as manual memory management. >> to back it up. What languages did you learn, in what order? Our previous post caused some controversy by questioning the validity of some commonly-held beliefs. Specifically, the beliefs that reference counting (RC) always requires less memory than tracing garbage collection (GC) and that tracing GCs require 3-4x more memory in order to perform adequately. 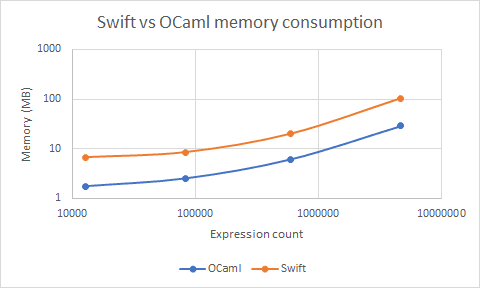 We presented a benchmark written in Swift and OCaml and noted that the RC'd Swift implementation ran over 5x slower and required over 3x more memory than the tracing GC'd OCaml implementation. This observation disproves these beliefs in their strong form and even brings into question whether there is even any validity in the weak forms of those beliefs. After all, we have never seen any empirical evidence to support these beliefs in any form. We received a lot of criticism for that post. The vast majority of the criticism was not constructive but two valid points did arise. Firstly, although our result was anomalous it would be more compelling to see the benchmark repeated across a wider variety of production languages using both RC and tracing GC because this would help to reduce the error caused by differences other than GC strategy. Secondly, it would be more compelling to repeat the study with different benchmark tasks in case this one problem (computing symbolic derivatives) is anomalous. This post addresses the former concern. We implemented equivalent solutions to the original Swift and OCaml, this time in F# and Mathematica. The F# uses a tracing garbage that is inherited from its runtime (either Mono or .NET). Mathematica is a domain specific language (DSL) designed specifically for computer algebra that uses its own heavily-optimized RC implementation so it stands the best possible chance of being able to compete with the original OCaml. So these additional measurements should usefully extend the applicability of our findings. The F# 4.0 code was run on Mono 4.6.2 directly on the Raspberry Pi 3 alongside the Swift and OCaml and also on .NET 4.7 on Windows 10 (i.e. different architecture and platform!). Our results for Mathematica represent excess memory consumption over the initial consumption (because Mathematica has a uniquely huge standard library) and were obtained running on Mathematica 11.2 in the cloud and 10.0.1 on the Raspberry Pi 3. Again, we find that this common belief that RC requires less memory to be unjustified.